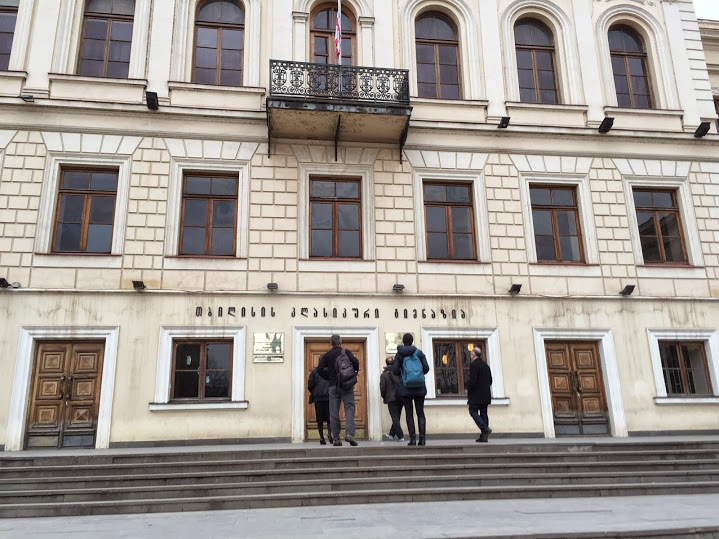 High School Number 1, an elegant neo-classical building situated a stone’s throw from the national parliament, is the oldest public school in Georgia and indeed the entire Caucasus region. Carrie James, Shari Tishman, Paul Salopek, and myself – in the company of Emi Kane and Stephen Kahn of the Abundance Foundation, as well as colleagues from the National Museum of Georgia – recently conducted a workshop there for students and teachers. 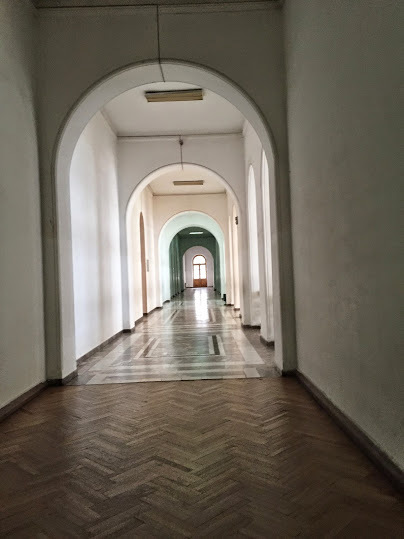 Ushered in through improbably solid wooden doors, we stepped into a sparse, whitewashed network of high-ceilinged corridors, devoid of the detritus of school life we are used to in North America. It was initially quiet, as if there were no students in the building. Later, we would hear eruptions of energy and laughter as children hurtled down the corridors. Our assigned classroom was austere, with gleaming wooden benches arranged amphitheater-style. On closer inspection, these benches were made of smooth, whorled laminate – one indication that the historic building was in fact completely restored after being burned to the ground during the civil unrest of 1991. Small portraits of Einstein, Newton and other famous physicists were hung high up on the walls; two subdued landscapes adorned the back wall. About twenty-five student faces looked expectantly down on us as we entered: girls sitting with girls, boys sitting with boys, except for one mixed trio to the left hand side. The floorboards creaked. Paul introduced his walk, focusing on the underpinning narrative of the migration of our ancient human ancestors out of Africa. Carrie, Shari and I then explained the principles of Out of Eden Learn and showed our short introductory video: it was strangely moving to watch images of student work from Lahore, Erbil, Vancouver, Barcelona, Sao Paulo and the like projected against a classroom wall in Tbilisi, Georgia – a place with which we had no preexisting connection until geopolitics and weather compelled Paul to winter there. Work in groups of three. As a group, find an object you would like to look at. Take five minutes to observe the object quietly. Each person write down at least 10 things you notice about it. Read your lists aloud to one another. Notice how your observations are similar and different. As a group, brainstorm several questions about the object. What do you wonder about it? Ask different kinds of questions. As a group, write down 4 or 5 questions you think are particularly interesting. Working individually, consider how the object connects to other things you know about, and to your own life. Think broadly about connections. Write down at least two connections you make. Read your connections aloud to one another. Notice how they are similar and different. 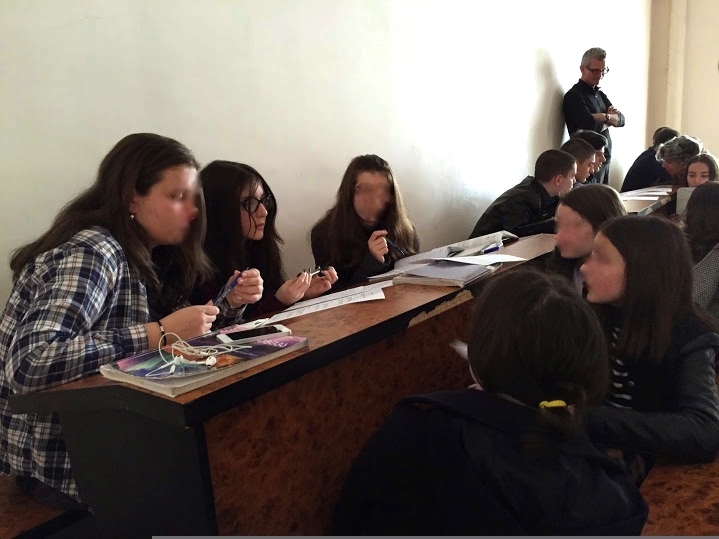 The students animatedly engaged in this activity – for the most part in Georgian – selecting smartphones, watches, pencils, glasses, and other objects that they had on hand. They noticed new things about their object’s shape and design and wondered about where and how it was made, as well as the history of this type of object over time. One girl said that she had started looking around the classroom with fresh eyes, noticing details she had never noticed before. For example, she and her partners debated the true color of the blackboard, which they had always assumed to be black but which was perhaps tinged deep green. She also reflected that the blackboard was special to them as a class because it was the place where new things were written for them to learn: it was something that brought them together. We have blurred students’ faces to protect their identity. I’m doing active learning on my own little two legs for the next few years, but seeing how you penetrate a hierarchical system at a post-Soviet school to get kids through this kind of tiered auditorium, you know to look at their wrist watch, I thought it was fabulous … there was truly unfeigned enthusiasm among the students that I was watching. You know you can tell. That was huge. We thank the teachers and students we met for so graciously engaging with our materials and giving us renewed confidence in the type of learning we are promoting through Out of Eden Learn: the appeal of slowing down and learning actively from others appears to translate across many different contexts. What a beautiful written language! I was curious to hear these lovely characters, so I watched a brief video (https://youtu.be/Q8tUdxFOOIU) on how to say “hello” in Georgian, which took me quite a few repetitions. 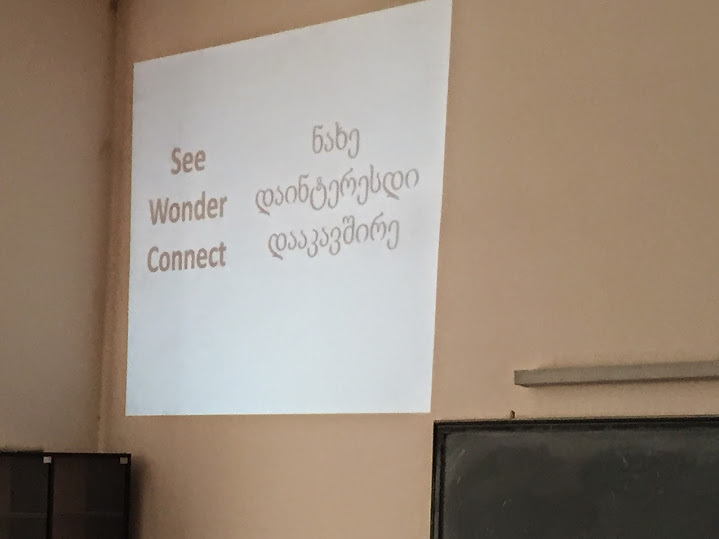 While I use similar thinking routines as See-Wonder-Connect in the classroom, I usually do so with a particular curricular aim, using specific artifacts connected to the subject we are studying. This post is reminded me of the benefits of focusing on generic artifacts chosen by students, especially when introducing a thinking routine, to highlight the power of focused observation and purposeful lenses of thought. I enjoyed seeing how you laid out the thinking routine steps for this group.